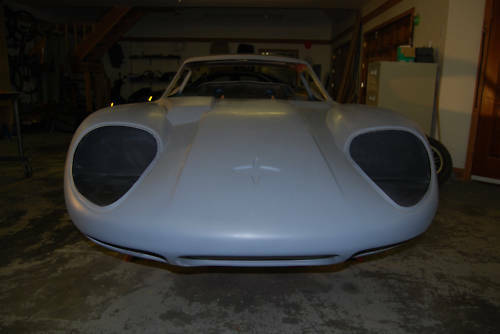 The basic style of the Marcos GT body has been around since 1963. It still looks good today. Just as interesting as the car itself is the Marcos company. It has been in and out of business more often that any other car company I can think of. (Jensen might give it a run for the money, I guess.) 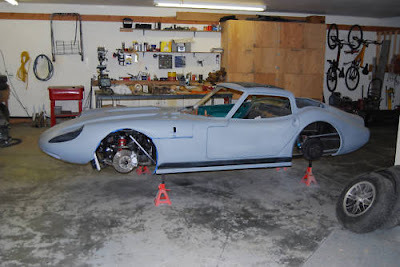 Back in March, 2009, I wrote about another Marcos GT. I included a bit of the company's history and some links. You can find that post here. Marcos cars are rare to begin with and extremely rare here in the US. Marcos attempted selling cars in the US in the late 1960s, but they didn't sell well and the costs of their efforts put the company out of business (for awhile, at least). I'm not sure what I think about this car. 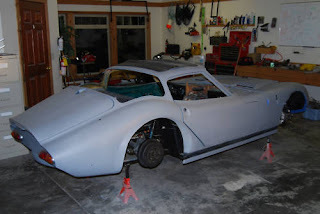 It's great to see this much effort going into restoring a rare car like this. The work that has been done so far is top notch. It will be great to see this beautiful body pass you on the highway. The problem I have is with the drivetrain. The GT came with a Ford V6 (or a Volvo engine in the US). 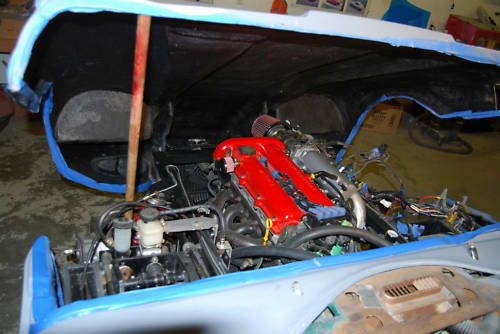 The owner has chosen to replace the original engine and transmission with ones from a Mazda Miata (MX-5). Granted, the little Mazda 4 is one of the finest 4 cylinder engines around. It puts out about as much power as the old Ford V6 did. It is a modern, easy to maintain engine and damn near indestructible. The Miata transmission is a fine transmission with well spaced gears. I don't know why the Mazda drive train bothers me. Over the years Marcos used engines from Ford, Rover, Austin, Volvo, Triumph, Chevrolet and maybe a few others. They never built their own engines, so why not throw a Mazda engine in one? It will most likely make it immensely more drivable. This car is a project that needs completion. Most of the hard stuff is done. It comes with most, of not all, of the parts you'll need to put it on the road. It's in primer with the interior out, so you can paint it any color you like. If the Mazda drive train doesn't bother you, this could be a great winter project. Located in Victoria, British Columbia, Canada, click here to see the eBay listing. I can understand your reservations about the Mazda driveline as I believe in the motto, "Stock Rocks". But as you suggest, so many varied powerplants were utilized in the Marcos during their lifetime, this one doesn't bother me as much as a 350 in a 36 Ford.